3' tall x 5' wide x 7' long construction scaffold. 1 section includes (2) end panels and (2) X-Braces. 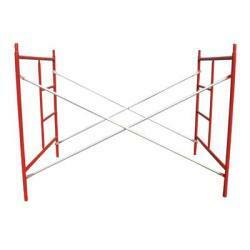 Stackable with other 5' x 7' construction scaffold. Wheels, planks, and other accessories are available. * Please call us with any questions about our pkg 3 foot scaffold section set rentals in Oak Grove MO, Blue Springs MO, Independence MO, Lexington MO, Odessa MO, Independence MO and Western Missouri.